Historic Landmarks - Monson Historical Society, Inc.
​Located on the corner of Main and Thompson Streets, it is owned and maintained by the Monson Historical Society as a house museum. Jacob Thompson moved from Holland, Massachusetts to this location, which at the time consisted of 195 acres. Mr. Thompson became a Councilor-at-Law and a farmer. He raised, along with his wife Hadassah Stone, 10 children. Starting in 1842, Jacob began selling portions of the land directly behind his house to the Town of Monson to serve as a cemetery. The Fuller House was originally owned by Dr. George E. Fuller, a Civil War surgeon and Monson historian. It was bequeathed by his granddaughter, Hatie Merchant Noble. The building's second floor serves as the office and archives of the Monson Historical Society. There are three rental office suites located on the first floor. The map below shows the location of the Flynt granite quarry on Margaret Street. The dashed lines show where the railroad bed is still evident today. 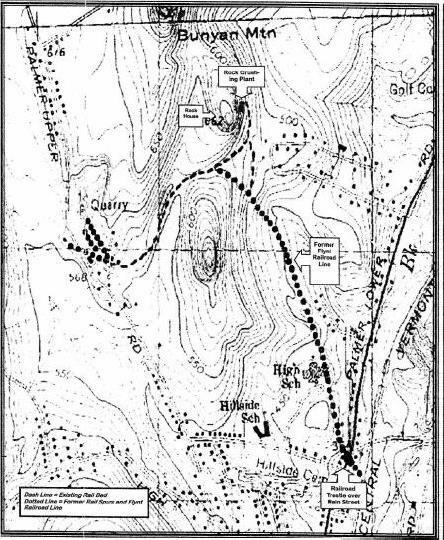 The dotted line shows the approximate areas of the 3 spur lines inside the quarry and where the former Flynt railroad line ran down through the countryside to the intersection of Chestnut Street and Main Street crossing over Route 32 with a railroad trestle (where the Monson Medical Center now exists) joining onto what was the New London Railroad.